Situated in an overwhelmingly noisy and dirty city, the attractions in Agra are nevertheless some of the most famous and beautiful in the world. Most people visit Agra primarily to see the Taj Mahal, and this glowing white monument more than justifies the trip all by itself. No matter how jaded or disenchanted a traveller is, the Taj conjures deep emotions; it is almost impossible not to be moved by the love story that birthed this splendid mausoleum, and even for those who don't like the soppy stuff the beauty of the building is mesmerising. 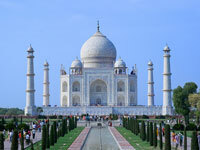 It is India's most popular and iconic attraction, and one of the most recognisable buildings in the world. Expect it to be busy no matter when you visit! To admire the Taj Mahal from a distance, and escape some of the crowds at the site, pay a visit to the Mehtah Bagh gardens where you can relax on the lawns and take photographs - the gardens are not exceptional, but the views are. Another world-class attraction in the city, very near the Taj Mahal, is the Agra Fort, a 16th-century Mughal monument containing a veritable treasure trove of impressive buildings. Things to see in the fort include the Jahangir Palace, the Khas Mahal, the Glass Palace (Sheesh Mahal) inlaid with thousands of mirrors, and two stunning mosques. Sha Jahan spent the last seven years of his life incarcerated in the ornately carved Octagonal Tower, which once had an enviable view of his beloved Taj Mahal. A less famous but very worthwhile site, the Tomb of Itimad-ud-Daulah is one of the best things to see in Agra. 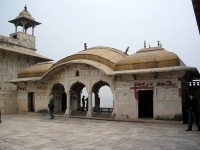 It is often called the mini-Taj and although it is small it is exquisitely carved and consistently ranks with visitors as one of Agra's great treasures. The attraction is usually quiet and seldom crowded, and its peaceful atmosphere is refreshing compared to the bustle of other attractions in Agra. Those who have time to adventure out of the city should consider an excursion to Fatehpur Sikri, a medieval fortress which was briefly the capital of the Mughal Empire, but was deserted in 1585 due to water shortages. This proud fortress now stands, perfectly preserved and a little spooky, in the arid landscape 25 miles (40km) west of Agra. 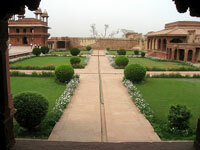 We are looking for contributors for our Agra travel guide. If you are a local, a regular traveller to Agra or a travel professional with time to contribute and answer occasional forum questions, please contact us.